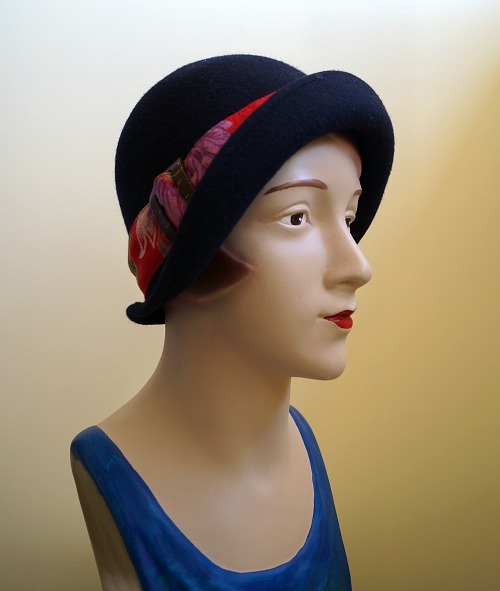 The travelling hat has been very busy lately! 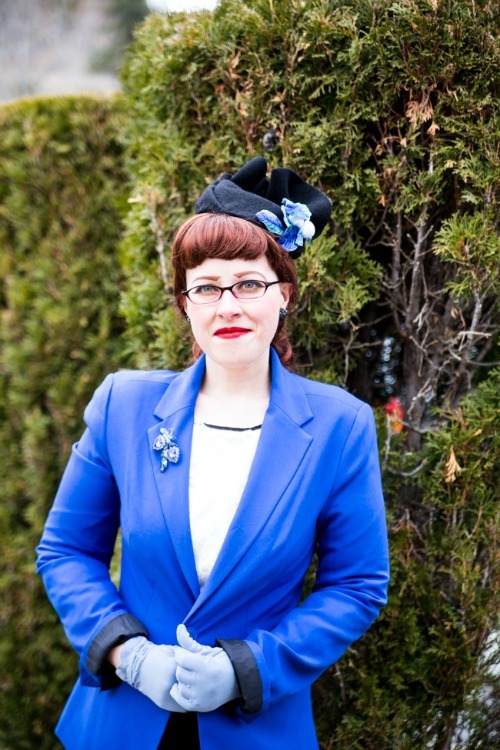 Just before she visited Joanna, she was spending time in Canada with the lovely Jessica of Chronically Vintage. Jessica, as you probably already know, is a super-sweetie and mega-stylish. 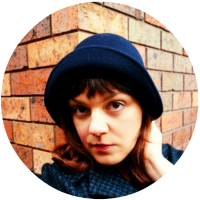 Hers is one of the first vintage blogs I started to read and she also became one of the first to comment on my own little blog. 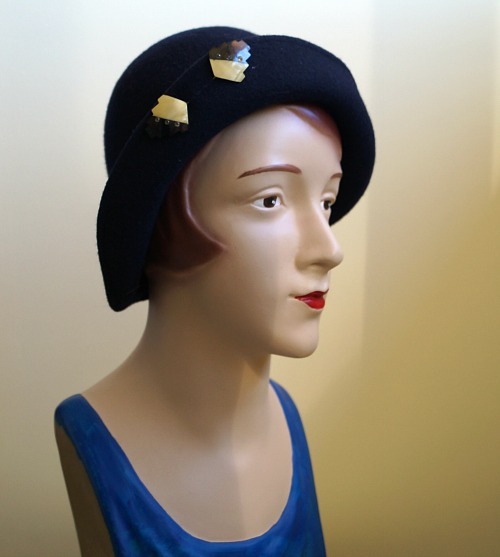 I'm very glad she chose to join in the travelling hat project. Naturally I recommend you pop over to Jessica's blog to see the rest of the outfit and some gorgeous close-up shots too. 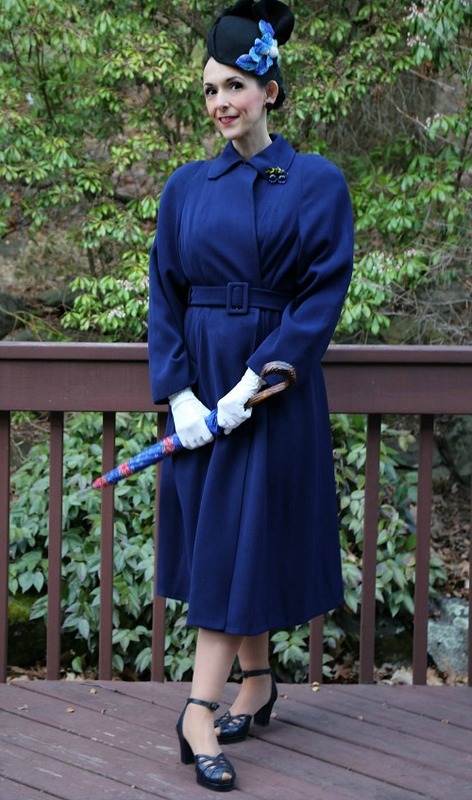 This member of the elite hat sisterhood is a very special one (well they all are, but still), because it was actually her travelling dress project that inspired me to start the travelling hat, and make Adelaide. Yes, it's Joanna from Dividing Vintage Moments. 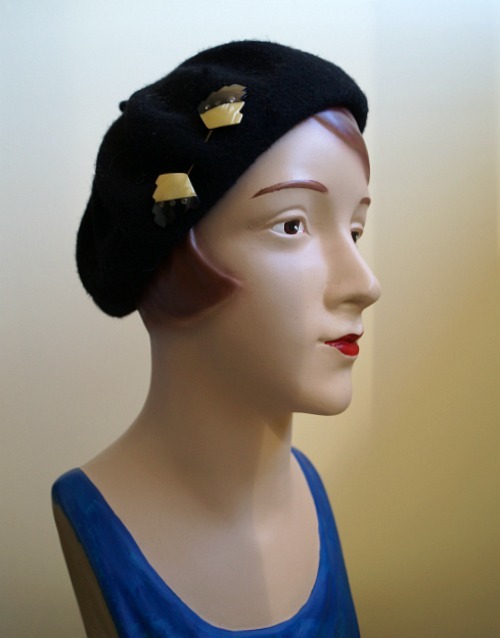 And not surprisingly, if you are familiar with her style, Joanna has paired the hat with one of her many stunning coats. I have serious coat envy whenever I see Joanna's outfits, and this is no exception. What a perfect ensemble. Look at the hat from this angle! What a great shot. 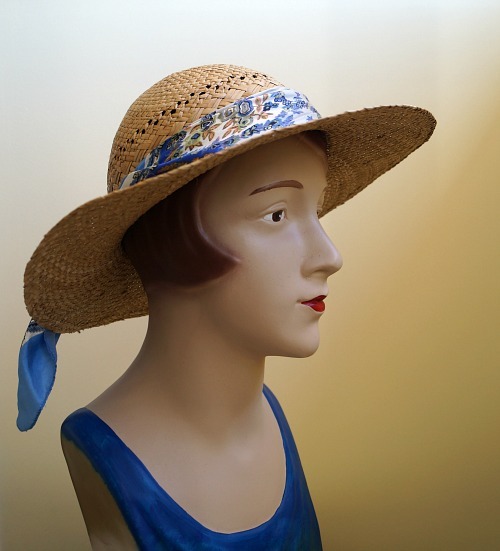 You can see more photos from Joanna on her instagram, and I also recommend you check out her blog, particularly the stylish adventures of the travelling vintage dress. As for Adelaide, she has one more stop in the USA before she comes back to Australian shores! So exciting! Don't forget to keep up with the travels by signing up to the newsletter, as well as getting heaps of bonus content too. 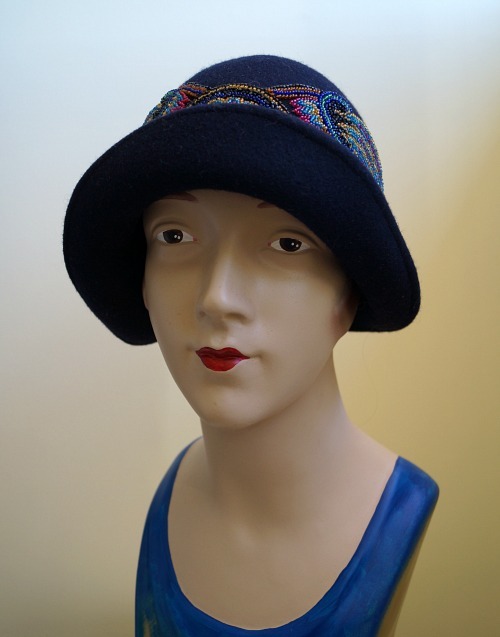 If you see a pathetic vintage hat and think it is past hope – don't despair! While there may be some cases that are usable only for study or for remnants, I think most are better able to be rescued than you would think. 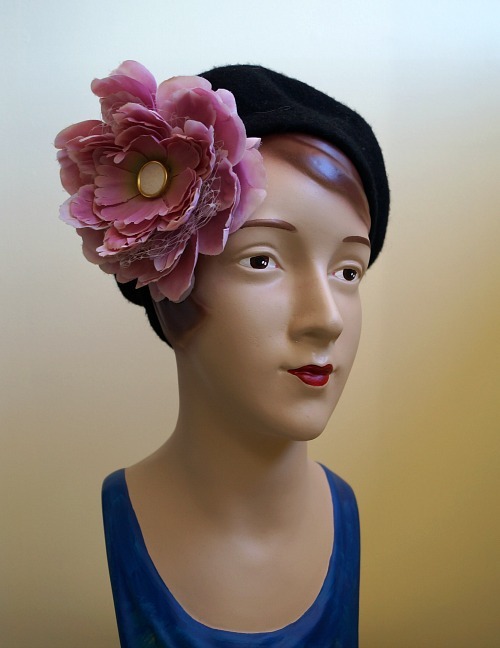 I have heard too many people tell me about the vintage hats they threw away because they were in a bad condition. So I wanted to really see what could be done. When I saw this hat for sale online, I knew I had to have it. It was perfect. Just what I was looking for. It had promise, but was in such bad shape that I didn't have to feel too nervous or guilty about setting my inexperienced hands to work. So I bought it. I hope I can inspire you to look twice at the truly sad cases too. With that aim in mind, I'm going to share the steps I took to bring this beauty back to life. Each hat is different, of course, and this is not necessarily the best method, or exactly what I would do again - I learned a lot from this experiment! 1. I removed the attached hat pins and the trim they were holding on. 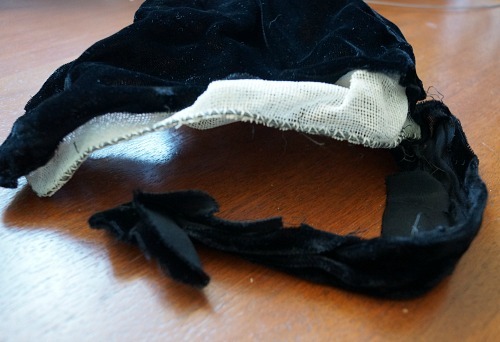 Then I unpicked the stitching to remove the petersham ribbon and the velvet covering. It was at this point that the hat's foundation started to reveal some of its secrets. There was clearly an edge on one side, as shown by a crease that was too regular to just be crushing damage. This was also where the separate strip of velvet had been. So I decided that this might actually be the front of the hat. 2. I worked on straightening the waves and kinks in the wire, and it became apparent as I worked which had been intentional bends, and which were damage, leaving me with an even clearer image of the original hat. 3. 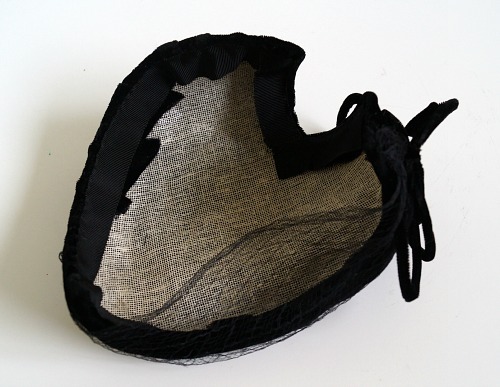 As I got the wire into shape, I also pushed the buckram out and started to see that shape emerge. 4. Placing the hat on a block (a Styrofoam head would have worked too) covered in cling film, I started to stuff newspaper under the cling film to fill out the hat shape to what I thought it had once been. 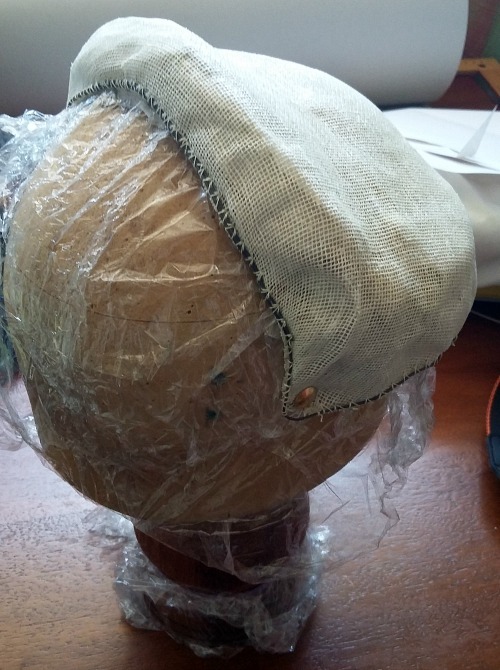 I continued to shape the wire and the buckram during this process, and also pinned the buckram down at a few key points as I worked. 6. When it was dry (I left it until the next day) I removed the hat and peeled off the cling wrap that was stuck to the underside. 7. Trying the hat on, I adjusted the wire again so that it would actually fit and stay on my head. 8. I chose to bind the wired edge with bias binding. 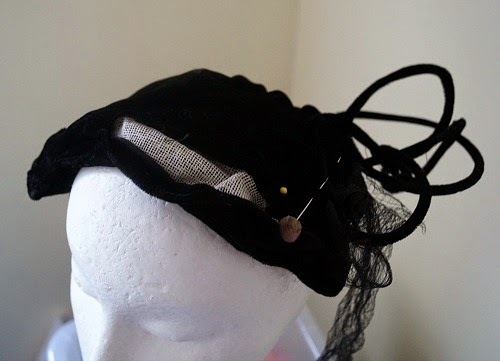 This is something I do with new hats, and I thought it would help keep the fraying edges of the buckram from poking through the velvet, creating a nice smooth edge, as well as being a back-up for holding the wire in place (although to be honest that stitching was still in excellent shape). 9. 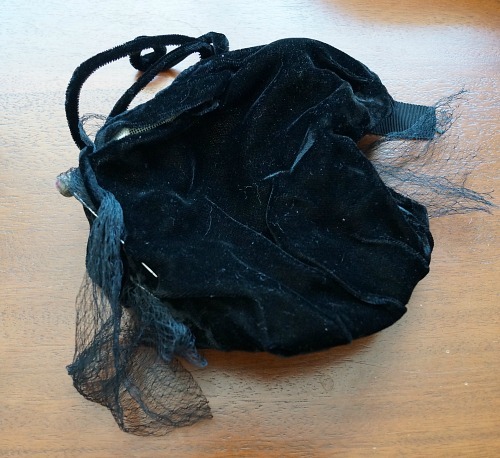 The velvet was a bit crushed and dusty, and thin in some places, but mostly still fine. I brushed it down with a clothes brush, and steamed it with the iron, but didn't press. 10. 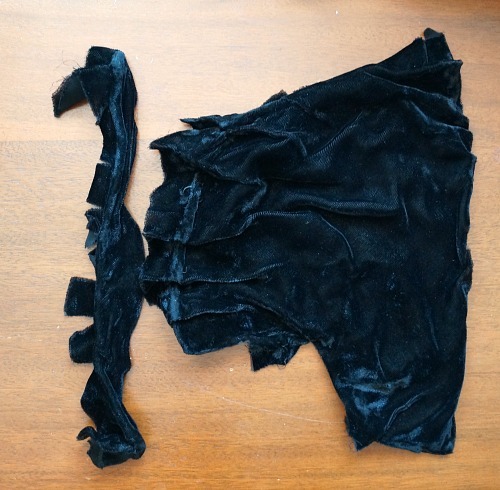 I reattached the velvet covering fabric, pinning it in place with a lot of pins to get it just right before proceeding. 11. Stitching the velvet in place, I was able to use the bias binding to secure my stitches in some places (another benefit of that step) which meant I was often able to keep the stitches on the underside and invisible from the outside. 12. 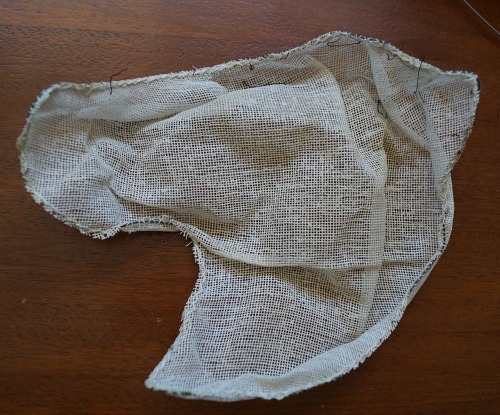 Then I cleaned up the petersham ribbon (hand-washed and ironed) and sewed it back into place. 13. Deciding where to attach the trim was tricky, since they were not attached when I bought it, just pinned on with the hat pins in an apparently random location. 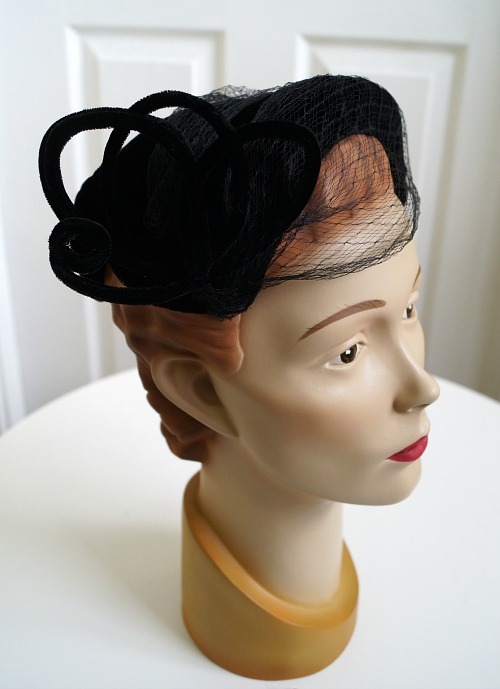 So I played around with it occasionally (for a few months) then asked an ex millinery teacher for her advice, and followed it. 14. To clean up the hat pins, I scrubbed the pin section with a dish-washing scouring sponge (this is how we used to clean fencing foils, so I figured it would work) and brushed the ends. What excites me most about this project is that the end result is better than I imagined in my most optimistic frame of mind. 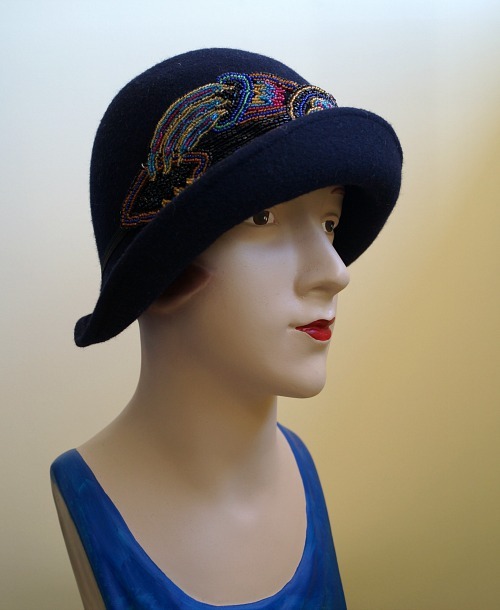 I imagined this hat becoming a tolerable but plain little cap, and instead it is a really pretty piece with a charming shape and gorgeous features. Not only that, but it is quite sturdy and ready to be worn and loved again. 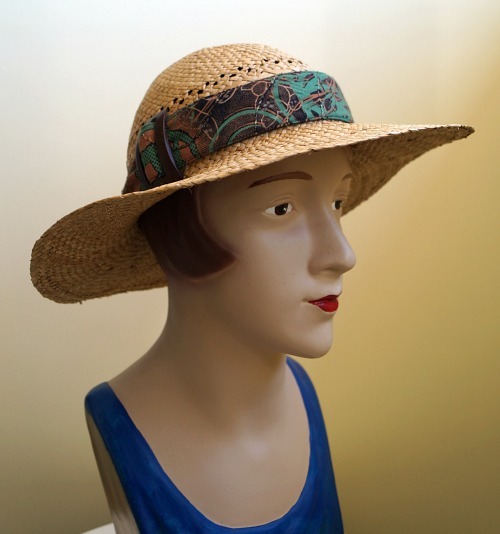 I'll bet you have some favourite everyday hats, and that they are fairly plain. The kind that go with everything and suit you really well, but maybe aren't the most exciting in the world. I want to inspire you to change them up a bit, but don't be frightened, because today we are all about temporary trims! I've mentioned that I'm a fan of ethical fashion once or twice, and a big part of that is to reduce what we purchase, and make the most of what we have. Being content with our possessions has psychological value too, especially in the face of seeing everyone else's amazing wardrobes and collections online. But we do want novelty, and we are programmed to do so. 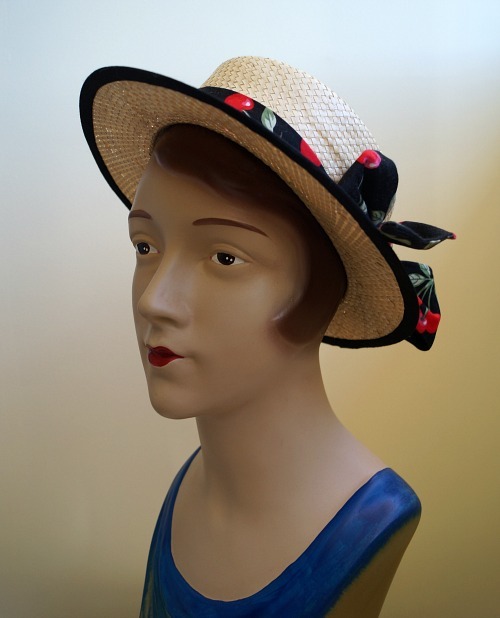 Which is way making over our current possessions is such a fabulous solution, and hats have long been a target for refashioning attentions. 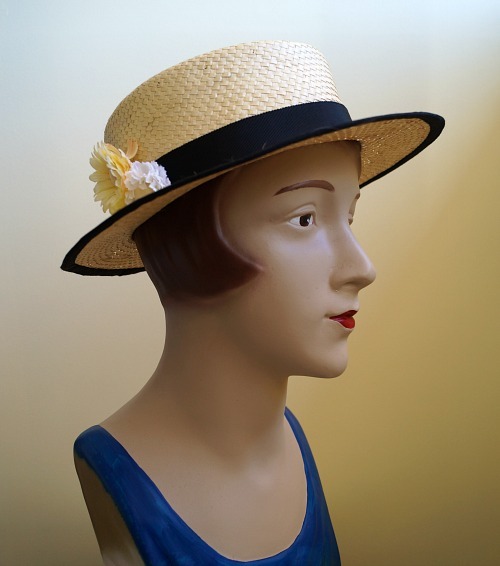 I am a big fan of serious makeovers, as you know, but today I want to look at the little, temporary, easy options for transforming a basic plain hat. The kind of things you could change day in, day out, do for a special occasion or each season or even each outfit! No cutting, no sewing, no special purchases. 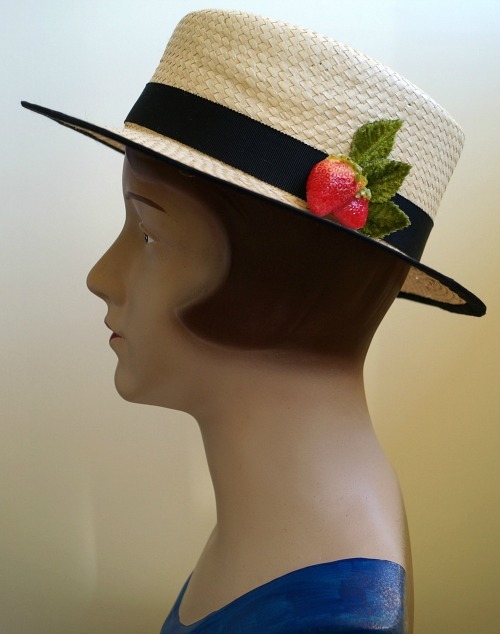 I've picked four plain hats to experiment with, and trimmed each one in a few new ways. Let's meet the "before" shots. 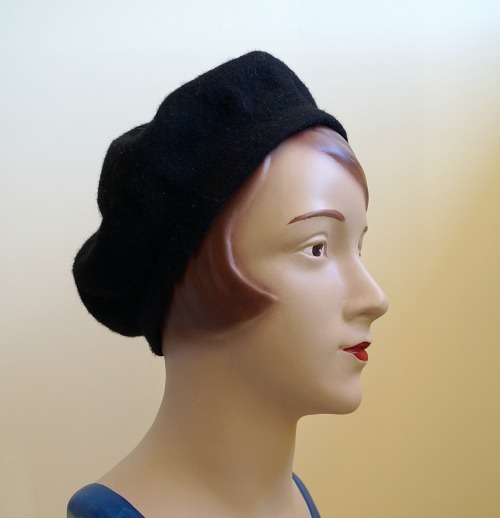 A plain black felt beret. Flattering, versatile and easy to wear. 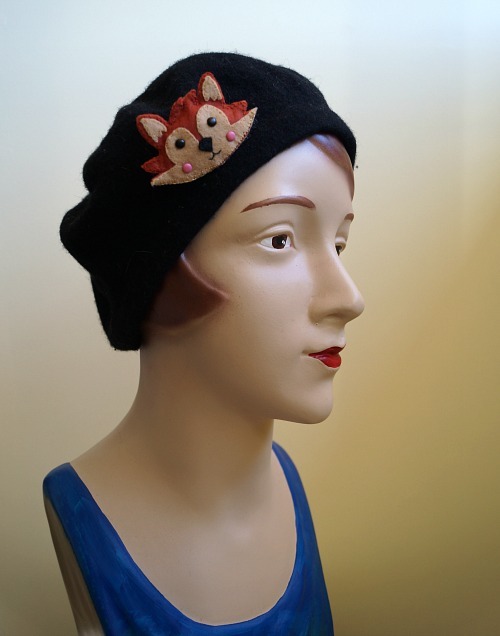 I find this a great go-to hat in the autumn and winter. 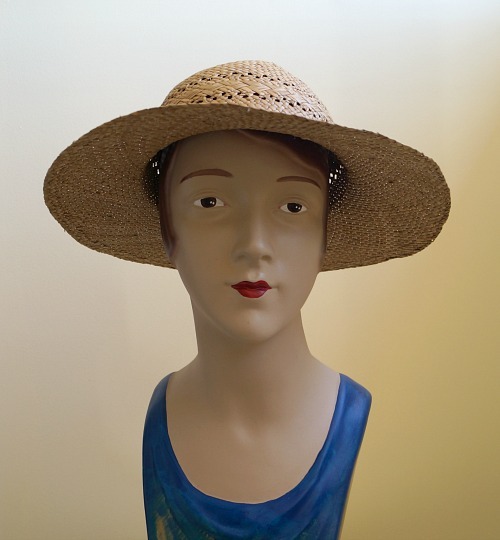 My recently rescued boater hat. 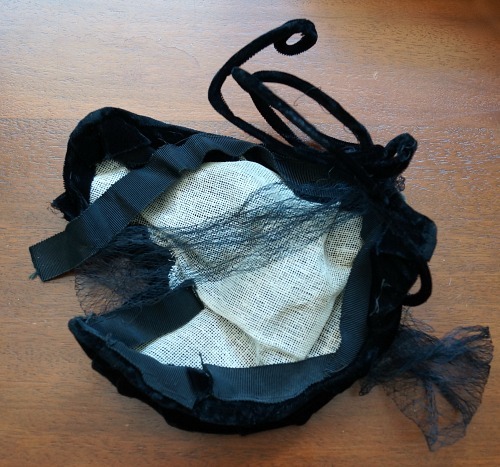 I love wearing this as it is, and I left it plain to make it less daunting to wear to the supermarket, but it could occasionally stand to be more fun. 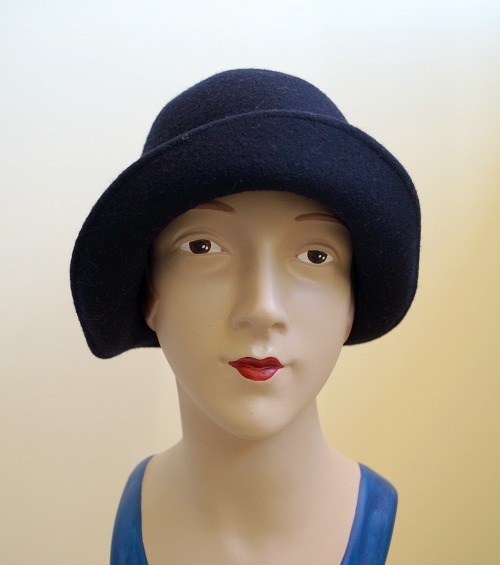 A navy felt cloche that belonged to my mother (before I stole it/was given it). Classic, elegant and easy to wear in winter. 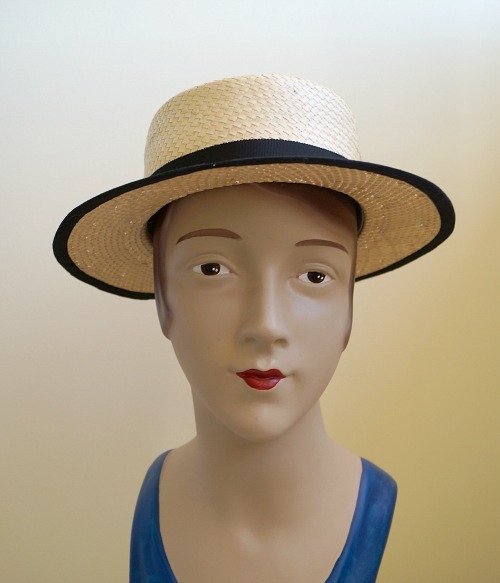 A plain straw hat I picked up second hand. This one actually isn't in my own wardrobe, but in my makeover pile. 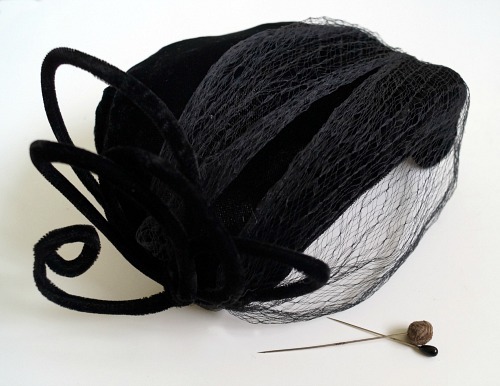 It's not super-exciting, but it is serviceable and would be a good gardening hat or casual going out hat. So let's take these hats and play dress ups!. Here are my six suggestions for temporary trims to spruce these guys up. Scarves are something many vintage fashionistas love and most people have hiding in their accessories pile somewhere. Failing that, they are easy to find for a few dollars at any op shop. 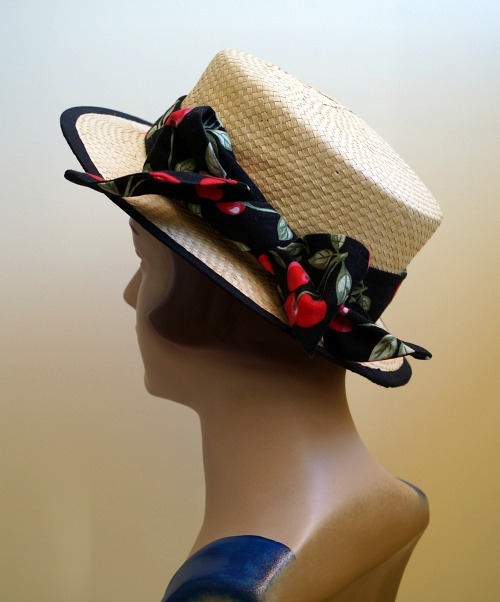 They are perfect for tying around the crown of a hat, and it takes mere moments. 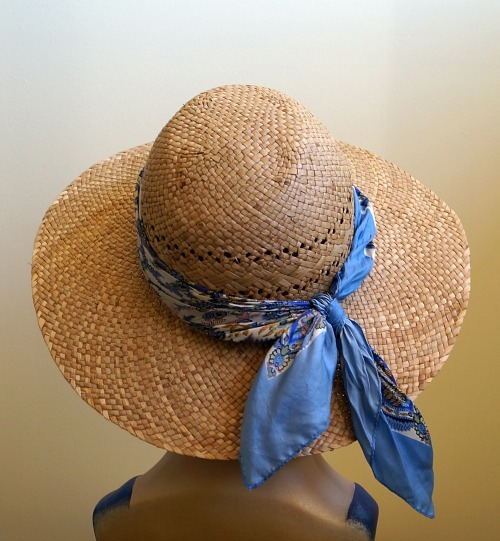 I've trimmed my boater hat with a long rectangular sewn head band. The band is wider than this, so I've folded it over before tying it on, then spread out the width in the bow to give the loops a fuller look. This one is a small square scarf I picked up at an op shop for a couple of dollars. I feel like this takes the hat from "scungy gardening" to "stylish gardening" at the very least, right? 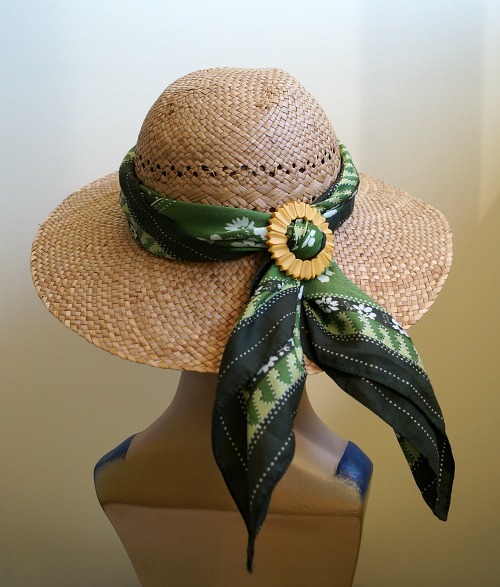 With a nicer hat and an ironed scarf it could look even better! Brooches are like some beautiful locust plague sweeping through the vintage fashion community, but even if you haven't succumbed to this particular addiction, you are bound to have one or two. If not, again, they are abundantly available second hand. Brooches are such a ridiculously easy trim option. 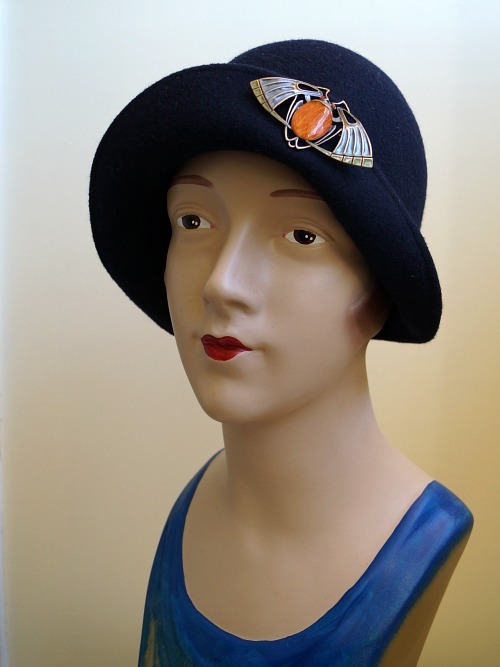 Here I've gone with a scarab on my cloche for a 20s Egyptian revival feel in a very light way! This little fox was a gift my sister made me for Christmas. So cute! 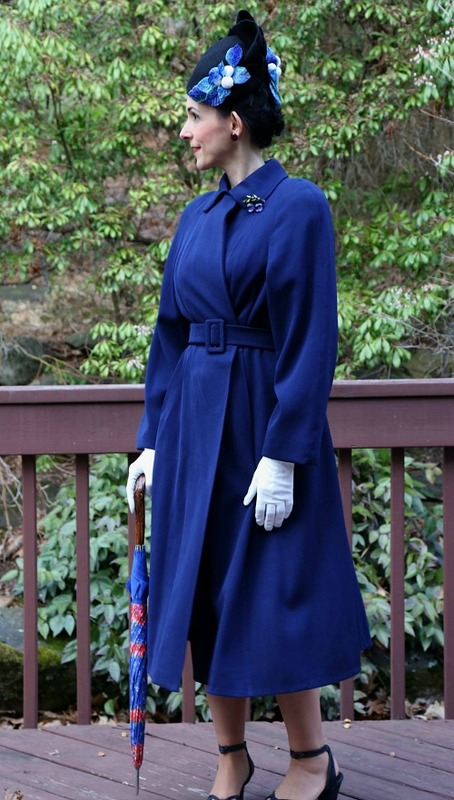 Of course a lot of these trim suggestions are great combined, like a brooch and a scarf together. This strawberry brooch wasn't quite enough by itself so I tucked in a few velvet leaves too. Hair flowers. Again, spreading like cane toads but with more style and posing less of a threat to native wildlife (as far as I'm aware). I'm talking about the ones with combs or alligator clips on the back, because how convenient that they already come with a method of attachment, but any artificial flowers can be pinned on in the same way. Maybe this is a little too much look, but you get the idea. This is one of the first hair flowers I made, and I kind of hate it, but worn like this I might actually be changing my mind! It blends in so nicely and looks a bit more subtle this way. Just some small blossoms for the boater. Apparently I like to keep it fairly plain. 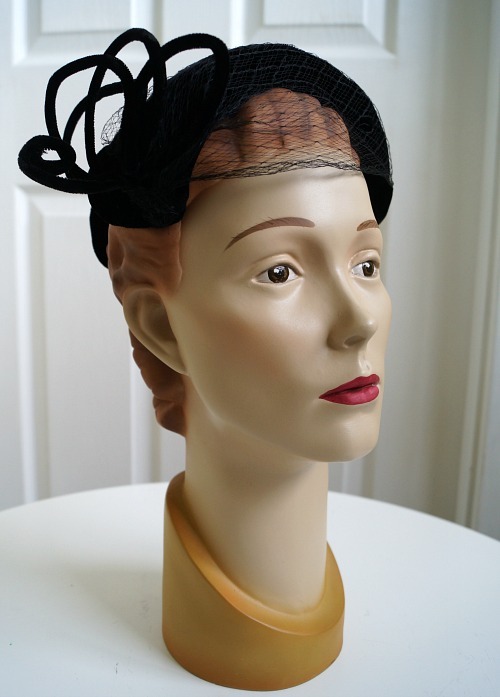 I love using vintage buckles as trim on hats, so why not do the same for a temporary trim? Loop some ribbon or a scarf through the buckle for a super simple attachment method with a bit of extra class. Then once I was playing with belt buckles, why not actual belts? I happen to have some fabric belts. To be honest, they aren't the best belts in the world, and I may end up using them more for hats than my waist. 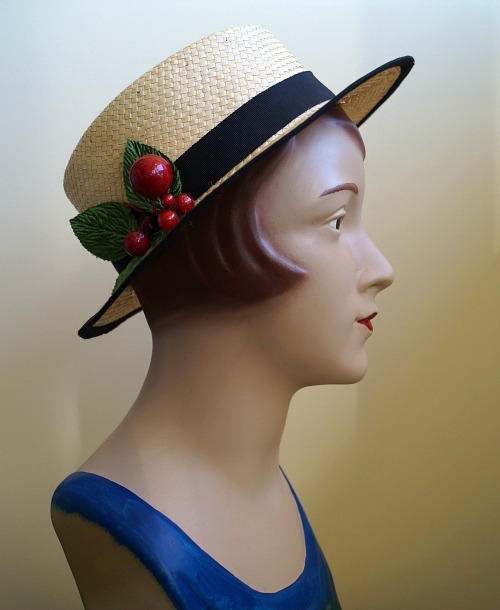 While great for holding hats on, they can be absolute works of art, so why not wear them just for decorative value? 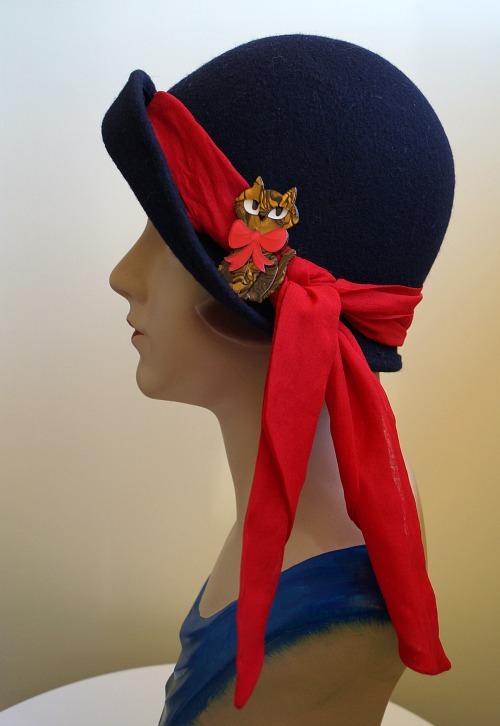 This is a new favourite (purchased recently from the Chronically Vintage Etsy store) and it may be a scarf or jabot pin rather than for hats, but I love it as a hat pin. 6. Whatever you can find! That seems like a pretty poor suggestion, but you may find, as I did, that as soon as you start playing with trims, you think of more ideas to try. I'm lucky enough, for example, to own this beautiful family piece of 1920s beading that I already have attached to elastic to wear as a headband. 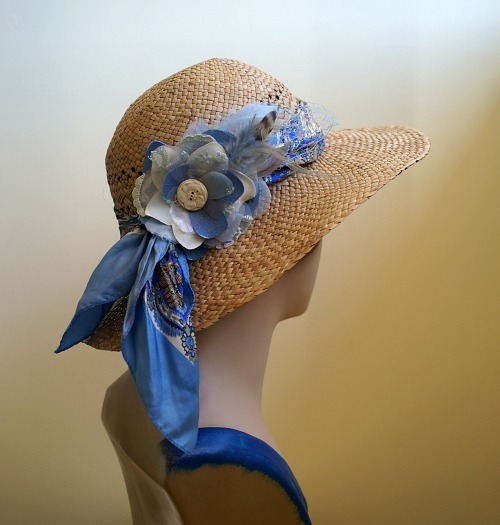 Since I also have a lot of unused millinery trims, they make a great temporary solution too. 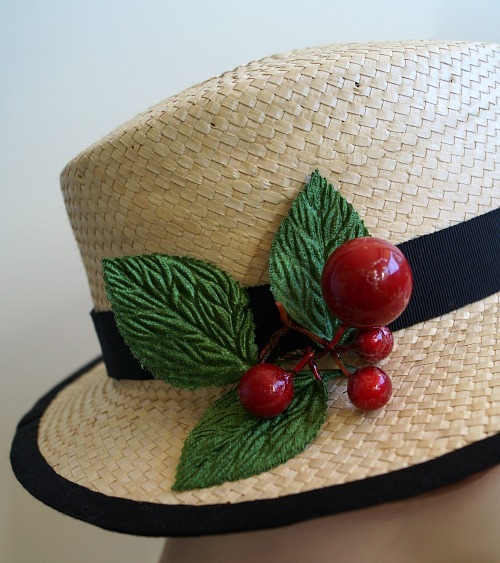 Apparently I like my boater hats with cherries so I tried that again with some cherries and velvet leaves, all just tucked in to the hat band. There we have it. I hope these have given you some food for thought! 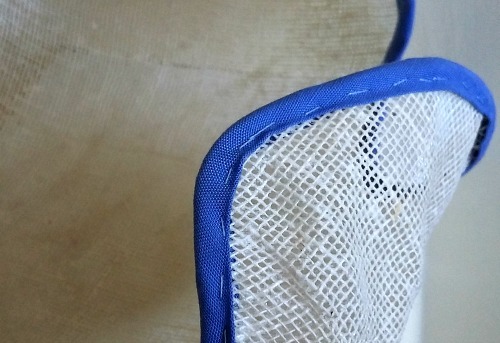 Do you do any of these already or do you have other ways you like to trim your hats? Will you be giving any of these suggestions a try? I'd love to hear if you do!